Takamul Investment, through its newly incorporated Centralized Utilities Company (CUC), has signed an agreement with the Special Economic Zone Authority at Duqm (SEZAD) to provide industrial utilities within the Duqm Special Economic Zone (SEZ). The 25-year agreement gives CUC exclusive rights to provide all utilities to the industrial zone within the Duqm SEZ. The agreement was signed today by HE Yahya bin Said bin Abdullah Al Jabri, Chairman of SEZAD and Nabil Al Ghassani, Chairman of Centralized Utilities Company, at the Knowledge Oasis Muscat (KOM). CUC is a joint venture between Takamul and Sembcorp Utilities, which is a global leader in the provision of utilities such as energy, water and on-site logistics to multiple customers in industrial sites. Sembcorp Utilities is owned by Sembcorp Industries, which is headquartered in Singapore and operates across six continents worldwide. Commenting on the strong relationship that Oman is developing with Singaporean investors, HE Yahya bin Said bin Abdullah Al Jabri said, "I am delighted to see that our close ties with Singapore are bearing fruit here in Oman and specifically in Duqm where these relations have been extended and deepened to be an effective and close cooperation that covers many fields. A strategic partner within a strategic project is bringing great innovation and prosperous initiatives for both partners." 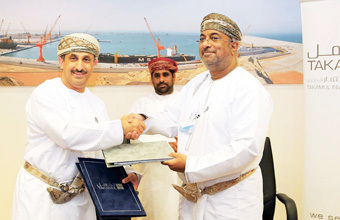 He further added "The establishment of the CUC will provide further and timely support to the Duqm Oil Refinery with respect to all its utility needs, as well as enhancing the value proposition of the Duqm-investment product to the industrial sector at large, including petrochemical and mineral processing. The joint venture will introduce a new utilities concept to Oman by operating a one-stop-shop for all utilities to greatly enhance and assist the industries in Duqm. The concept of centralized utilities offers industries with reliable utilities supplies, creating synergies, as well as the opportunity to benefit from economies of scale, and savings on investment and operating costs, thereby allowing businesses to focus on their core operations. The one-stop-shop facility helps position Duqm as an increasingly attractive location for industrial investment, creating a competitive edge in differentiating the Duqm Special Economic Zone from regional peers. "This cooperation between SEZAD and Takamul is a significant step in a very positive direction in bringing important long-term economic and social benefits to the Duqm area and Oman as a whole. Takamul\'s pioneering investment in the industrial services sector will contribute to the overall and long term success of SEZAD by encouraging development of industries. We know these industries will also provide good and worthwhile careers for Omanis who wish to develop their skills by being involved in the great many opportunities that will flow from the zone," Nabil Al Ghassani, Chairman of Centralized Utilities Company, outlined during the signing ceremony. Upon the establishment of CUC, industries will only need to coordinate with one entity in order to address their utility and permit requirements. The utilities to be provided will include steam, industrial gases, process water, and seawater for cooling purposes, captive power, distribution of natural gases and industrial waste water treatment. In addition, CUC will manage the utilities and service corridors within the industrial zone ensuring reliable supply and efficient operation to industries in Duqm. Commenting on the agreement, Abdullah Al Hashimi, Project Director of CUC, said, "I would like to thank SEZAD for the great opportunity provided to us to build a new utilities concept in Oman. We have invested a lot of resources in preparing this initiative and today we are celebrating a very important milestone. We believe in our team and in our partners, Sembcorp Utilities, and together we can leverage the strategic location of Duqm to build an attractive and competitive industrial destination." CUC is a joint venture between Takamul Investment, holding 65%, and Sembcorp Utilities from Singapore, holding the remaining 35% through its wholly-owned unit Sembcorp Utilities (Oman). Bringing together the industrial utilities experience of Sembcorp and the project development capabilities of Takamul with the cooperation of SEZAD is a recipe for success in this new unique industrial development in Duqm. Strategically located along the Gulf of Oman with a long coastline running along the Arabian Sea, Duqm has been targeted for development as a major maritime gateway for trade in crude oil from the Gulf, and as an important industrial and commercial hub. With a land area of 1,777 square kilometers and an 80-kilometre coastline, the Duqm SEZ will rank as the largest SEZ in the Middle East and North Africa region and one of the largest in the world. It will be administered, regulated and developed by the Duqm Special Economic Zone Authority, a financially and administratively independent government entity. Encompassing a sea port, city center, industrial zone, tourism zone, logistics center and an education and training zone, all supported by a multimodal transport system connecting the SEZ to nearby regions, the development of the SEZ is expected to take place in three phases from now until 2025.